For starters, I did complete my 3-month challenge with the NaturallClub on June 1st, Yayyyyyyy. Yes, I lasted the entire 3 months without flat ironing and blow drying my hair. I will make a separate post talking about some things I learned and to see if I achieved my goal. However, here is the wash day post, from that particular day, when the challenge was over, and I flat ironed my hair...stay tuned!!!!!!!!!!!! First, I sprayed my hair with plain water and finger detangled. After I finger detangled a section of hair, I flat twisted it.This process took about 30 mins. Here are photos of the detangled side vs the tangled side. 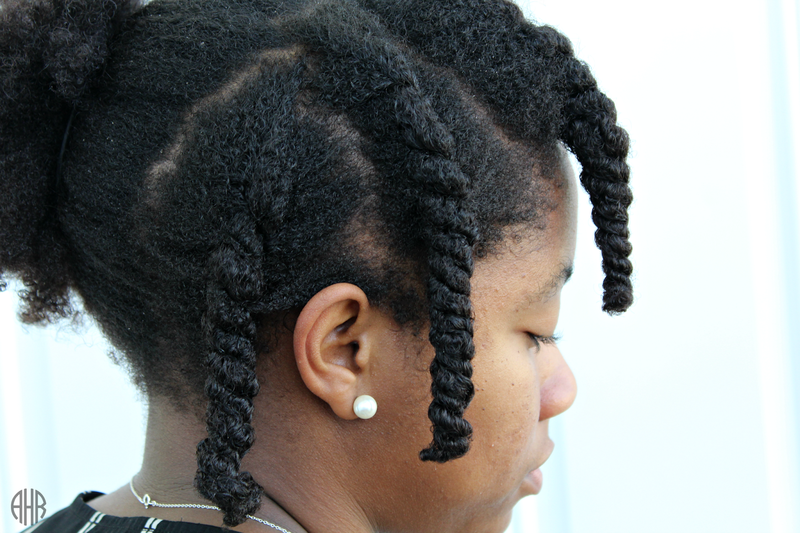 I processed to detangle and separate my hair into twists. Next, I hopped in the shower, unraveled each twist, and clarified my hair using Paul Mitchell's Shampoo Three Clarifying Shampoo. I only applied the shampoo to my scalp and massaged using my fingers and my Tangle Teezer. After rinsing out the clarifying shampoo, I added another shampoo, but this time, a moisturizing one by Organix called Morrocan Oil Creme Shampoo. I repeated the same steps as I did with the clarifying shampoo and rinsed it out. 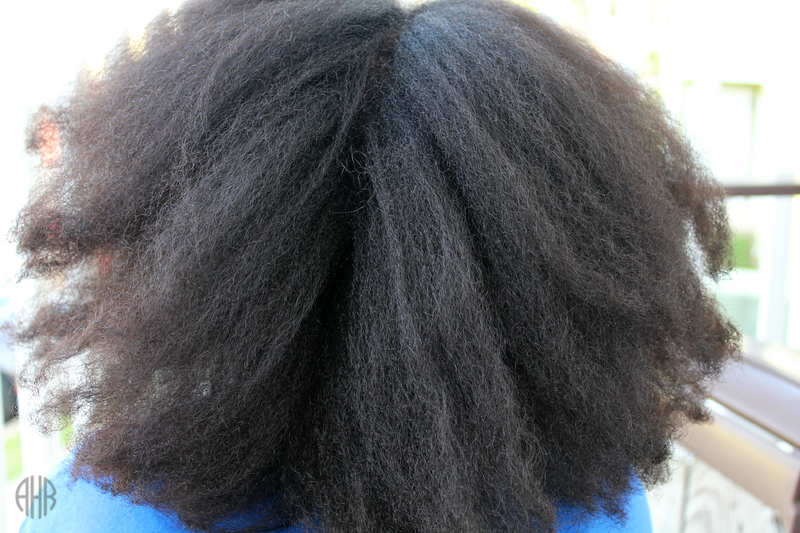 As for deep conditioning, I used Miracle 7's Deep Conditioner in the blue bottle. 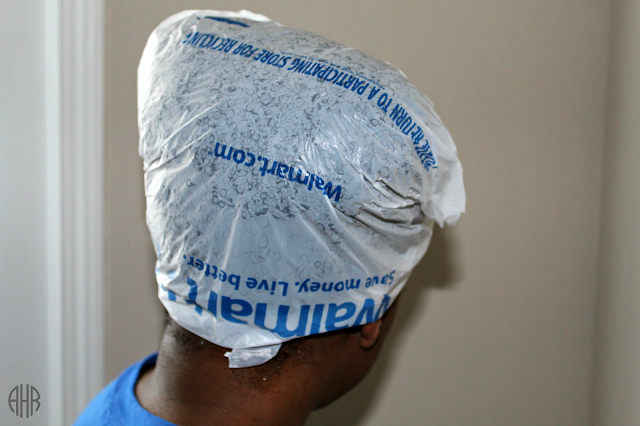 I put my hair in a high ponytail and put a plastic bag over my hair. 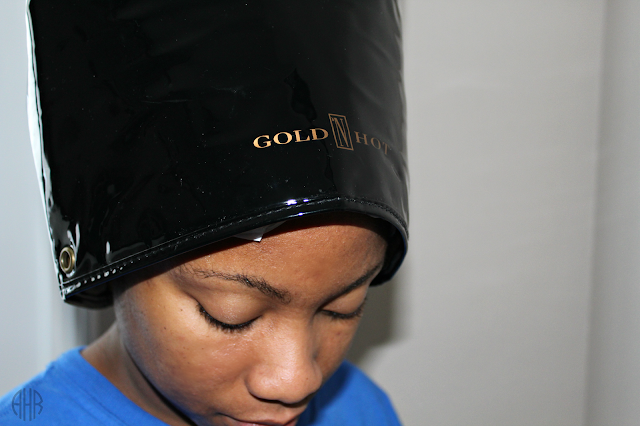 Then I sat under my conditioning cap by Gold N Hot for 30 mins. 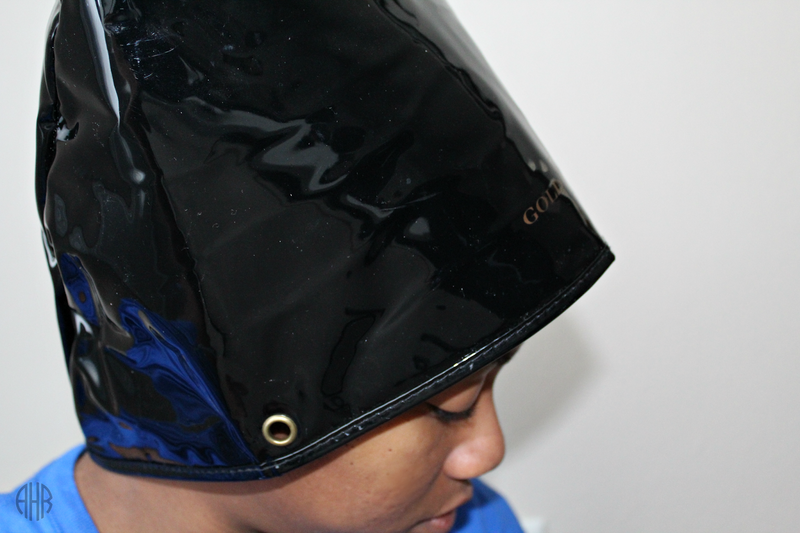 If you want to check out my review on this cap then click here. Side note! Here is a shot of my husband's hair too (giggles). We were playing around with this new camera we purchased, trying to find the best angles, and I took a quick shot of his hair. 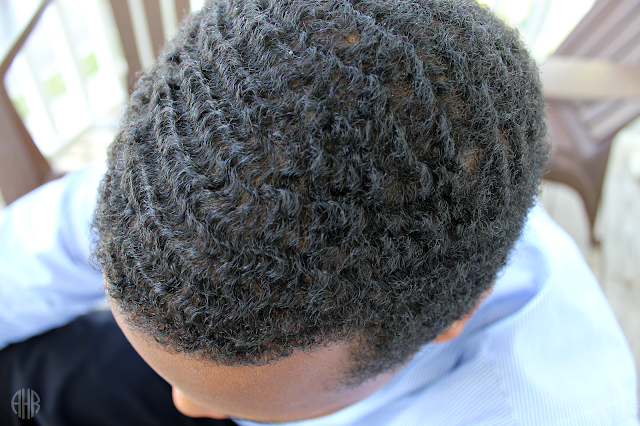 He has really nice curls. Back to the post! Here is a shot of my hair, freshly deep conditioned, and still in a ponytail. Next, I rinsed the conditioner out of my hair and shook dry. Here are photos from that moment. 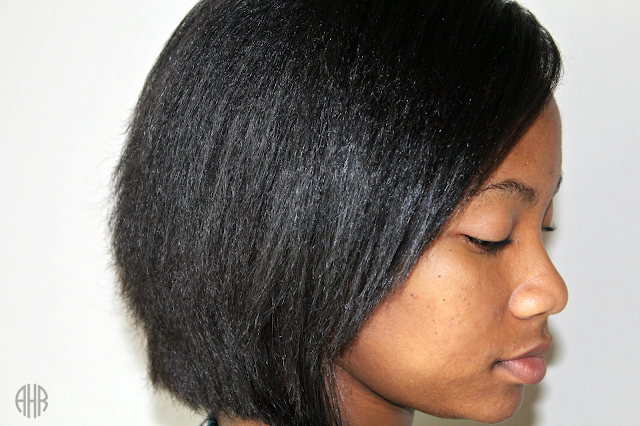 From that point, I blow dried my hair, which was incredibly difficult and frustrating for me. It seemed like my hair was matted worse than ever before. I hadn't used a comb since January and I had only finger detangled my hair. I lost a lot of hair in the process of detangling with a wide tooth comb and wrestling with a blowdryer with a comb attachment. 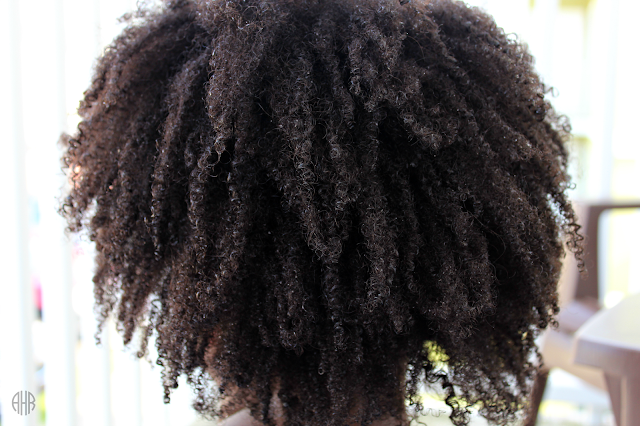 I am in agreeance that finger detangling is the best way to preserve curls and for length retention. However, the whole ordeal of blow drying my hair was awful. Even though the floor was covered in hair of all shaped and broken sizes, I still managed to have lots of hair still attached to my scalp. Needless to say, I felt discouraged about the whole ordeal. Here is a photo of my hair after blow-drying. On top of that, I gave myself a really bad cut that made me look like Dora from DORA THE EXPLORER. It was box shaped at the ends and bulky. I had an unintentional high-low thing going on that made me look like T-Boz from TLC. It was just awful. My husband, bless his heart, tried to help me even it up but he was too afraid to cut it. I didn't know whether to laugh or cry as I swept up my pile of chopped hair off of the bathroom floor that resembled the size of a large ant hill. I'm sure my husband thought I was crazy at this point but he showed nothing but love. The next day, after work, I went to have my hair cut FIXED which meant getting a more drastic cut....in layers....that was super short. See I told you this would be a good story and it's not over yet. I'm sorry I don't have photos but that would have made it funnier. Once I reminded her, she asked the stylist adjacent to us if she should use the thinning shears on my hair. Both the adjacent stylist and I were in agreeance that she should DEFINITELY NOT USE THINNING SHEARS FOR MY TYPE OF HAIR. At that moment, the adjacent stylist (and my saving grace) told me that her name was Khris. Khris proceeded to ask what did I come in to get done. I told her. The lady currently styling my hair interjected and said, "If you like, we can relax it for you." Oh, how I wish that what I am telling you through typing was not the truth. Words could not express how I felt in that moment but words like misunderstood, and crushed, came to mind. In a quick response, Khris blurted out, "No, she is natural. 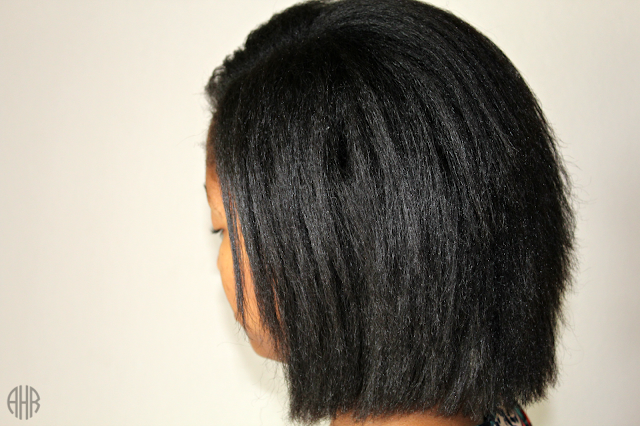 She doesn't want a relaxer." She went on to say that she could cut my hair into layers for me and flatten it out with a flat-iron. With bright eyes, I asked my current stylist if she would mind if I switched to Kris's chair since she was more knowledgeable about my hair type. Kris cut and styled my hair and I was very happy from that point on. Patience is key. Finger detangling does help with length retention and cutting off your hair, in the middle of the night, while under stress, is bad. I know. I know. All that hair that I had worked so hard to preserve for the 3-month challenge is now GONE!!!!! I felt fine about the decision because I liked that cut. If you have followed me since 2013, then you know that I started off at this same length. It's like I pressed that re-do button for my hair. However, looking back at how much hair I preserved and how long it was, makes me miss the length. Oh, I miss wearing ponytails too. However, I know that at the end of the day, my hair will grow back. 10 comments on "Wash Day?!?!?" Hi There, first off, I'm sorry and congrats...I say both because I'm sorry you had to cut your hair but congrats because your hair is gorgeous. You are working that cut so slay and werk, slay and werk and slay and werk some more. I'm with Ebony...I had a range of emotions reading this. Thank goodness for Khris! I agree with Ebony!!! OMG the roller coaster of EMOTIONS!!!! I'm sooo sorry that this wash day was soo cray cray. But I'm super proud of you for not allowing all of the emotions change your perspective on your hair! The cut is very very cute. I think that the layers will give your curls dimension and a gorgeous shape. 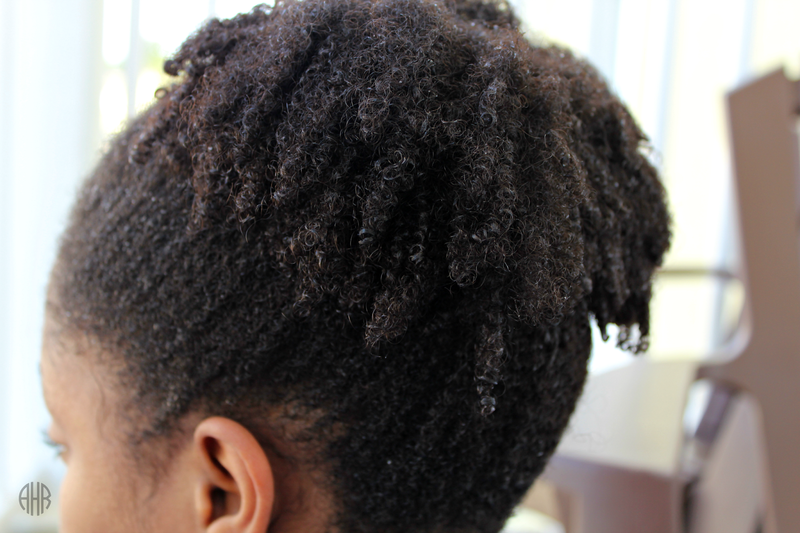 I think that after wearing your hair curly for months and months---if can be extremely hard to get those sleek smooth results because your curls have been accustomed to clumping and curling in their own natural way. 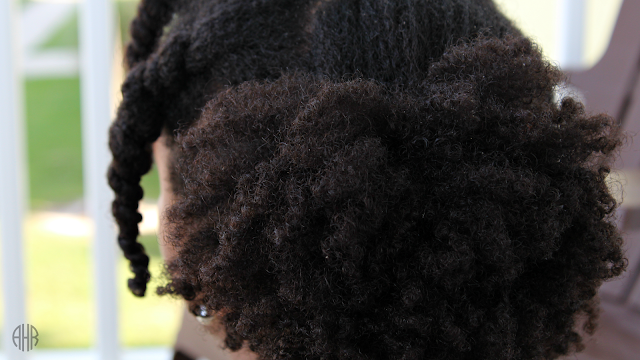 When I change the sections that I typically detangle in---I get a bunch of tangles and knots. So I think that you did a fantastic job of finger detangling but those curls just wanted to do their own thing!! Can't wait to see your curls again! I know that they will look amazing! 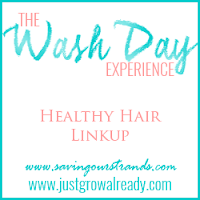 Thanks for sharing your #washdayexperience chica! Thanks KLP and same here. I noticed that my curls were rebellious as ever and did not want to flatten out. :) Fingers crossed that they come back with all their curly glory. I miss the curls already lol. That is why I only use stylists for braiding or styling the hair. If I want to do a haircut, I go to a hairdresser. Your haircut is very cute though!